BirthWatch offers gestational development facts that are fun to share with your friends and family to keep them up to date with what's happening in your pregnancy. BirthWatch also has tips for you to consider as you make your way through your pregnancy. Don't view these as a checklist of things everyone must do, but rather as suggestions to investigate or consider applying. If you are unfamiliar with the topics covered in these tips and they interes you, share them with your friends to benefit from their experience and insight. Since we realize not all of the tips are for everyone, tips are only published when you manually post them to Facebook. 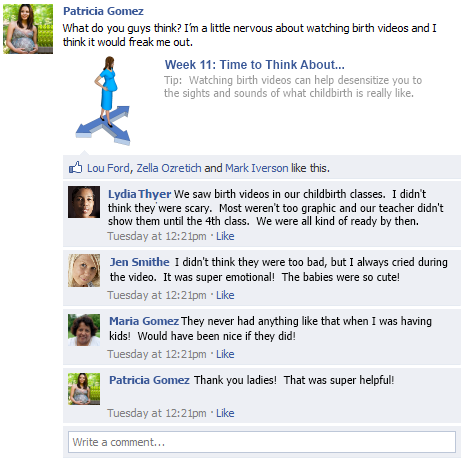 They are never posted by the scheduled process that shares facts with the pregnancy week ticker. Our intention is that you should use the BirthWatch tips as conversation starters with your friends and family. If there is a tip that interests you, but you are not sure if it is right for you, post it to Facebook with your own message such as "I'm thinking of trying this but am not sure. What's your experience with this?" Some of your friends and family have a wealth of experience with pregnancy and may have relevant thoughts and opinions for the tip you are evaluating. Take advantage of your support network to get advice from those you trust and rely on most: your friends!